Leopold's administration of the Congo was marred by murder, torture, and other atrocities. His regime was characterized by notorious systematic brutality. The hands of men, women, and children were amputated when the quota of rubber was not met. Thousands were sold into slavery. These and other facts were established at the time by eyewitness testimony and on-site inspection by an international Commission of Inquiry (1904). Millions of the Congolese people died: modern estimates range from one million to 15 million deaths, with a consensus growing around 10 million. Some historians argue against this figure due to the absence of reliable censuses, the enormous mortality of diseases such as smallpox or sleeping sickness, and the fact that there were only 175 administrative agents in charge of rubber exploitation. 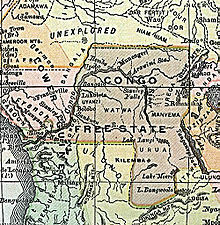 In 1908 reports of deaths and abuse in the Congo induced the Belgian government to take over the administration of the Congo, free from Leopold's oversight. Leopold was born in Brussels on 9 April 1835, the second child of the reigning Belgian monarch, Leopold I, and of his second wife, Louise, the daughter of King Louis Philippe of France. The French Revolution of 1848 forced Louis Philippe to flee to the United Kingdom. The British monarch, Queen Victoria, was Leopold II's first cousin, as Leopold's father and Victoria's mother were siblings. Louis Philippe died two years later, in 1850. Leopold's fragile mother was deeply affected by the death of her father, and her health deteriorated. She died of tuberculosis that same year, when Leopold was 15 years old. Three years later in 1853, at the age of 18, he married Marie Henriette of Austria in Brussels on 22 August. Marie Henriette was a cousin of Emperor Franz Joseph I of Austria, and granddaughter of Leopold II, Holy Roman Emperor through her father, Austrian archduke Joseph. Marie Henriette was lively and energetic, and endeared herself to the people by her character and benevolence, and her beauty gained for her the sobriquet of "The Rose of Brabant". She was also an accomplished artist and musician. She was passionate about horseback riding to the point that she would care for her horses personally. Some joked about this "marriage of a stableman and a nun", the shy and withdrawn Leopold referred to as the nun. A political cartoon pillorying Leopold's love affair with Caroline Lacroix. The King: You should try it for yourself! Leopold had many mistresses. In 1899, in his sixty-fifth year, Leopold took as a mistress Caroline Lacroix, a sixteen-year-old French prostitute, and they remained together for the next decade until his death. Leopold lavished upon her large sums of money, estates, gifts, and a noble title, Baroness Vaughan. Owing to these gifts and the unofficial nature of their relationship, Caroline was deeply unpopular among the Belgian people and internationally. She and Leopold married secretly in a religious ceremony five days before his death. Their failure to perform a civil ceremony rendered the marriage invalid under Belgian law. After the king's death, it was soon discovered that he had left Caroline a large fortune, which the Belgian government and Leopold's three estranged daughters tried to seize as rightfully theirs. Caroline bore two sons who were probably Leopold's; the boys would have had a strong claim to the throne had the marriage been valid. 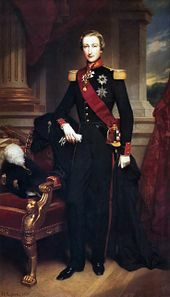 As Leopold's older brother, also named Louis Philippe, had died the year before Leopold's birth, Leopold was heir to the throne from his birth. When he was 9 years old, Leopold received the title of Duke of Brabant, and was appointed a sub-lieutenant in the army. He served in the army until his accession in 1865, by which time he had reached the rank of lieutenant-general. Leopold's public career began on his attaining the age of majority in 1855, when he became a member of the Belgian Senate. He took an active interest in the senate, especially in matters concerning the development of Belgium and its trade, and began to urge Belgium's acquisition of colonies. Leopold traveled extensively abroad from 1854 to 1865, visiting India, China, Egypt, and the countries on the Mediterranean coast of Africa. His father died on December 10, 1865, and Leopold took the oath of office on December 17, in his thirtieth year. Leopold's reign was marked by a number of major political developments. The Liberals governed Belgium from 1857 to 1880, and during its final year in power legislated the Frère-Orban Law of 1879. This law created free, secular, compulsory primary schools supported by the state and withdrew all state support from Roman Catholic primary schools. The Catholic Party obtained a parliamentary majority in 1880, and four years later restored state support to Catholic schools. In 1885, various socialist and social democratic groups drew together and formed the Labour Party. Increasing social unrest and the rise of the Labour Party forced the adoption of universal male suffrage in 1893. During Leopold's reign other social changes were enacted into law. Among these were the right of workers to form labour unions and the abolition of the livret d'ouvrier, an employment record book. Laws against child labour were passed. Children younger than 12 were not allowed to work in factories, children younger than 16 were not allowed to work at night, and women younger than 21 years old were not allowed to work underground. Workers gained the right to be compensated for workplace accidents, and were given Sundays off. Leopold emphasized military defence as the basis of neutrality, and strove to make Belgium less vulnerable militarily. He achieved the construction of defensive fortresses at Liège, at Namur and at Antwerp. During the Franco-Prussian War, he managed to preserve Belgium's neutrality in a period of unusual difficulty and danger. Leopold pushed for a reform in military service, but he was unable to obtain one until he was on his deathbed. Under the old system of Remplacement, the Belgian army was a combination of volunteers and a lottery, and it was possible for men to pay for substitutes for service. This was replaced by a system in which one son in every family would have to serve in the military. Leopold commissioned a great number of buildings, urban projects and public works, largely with the profits generated from exploitation of natural resources and the population of the Congo. These projects earned him the epithet of "Builder King" (Koning-Bouwheer in Dutch, le Roi-Bâtisseur in French). 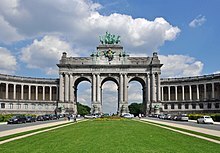 The public buildings were mainly in Brussels, Ostend and Antwerp, and include the Hippodrome Wellington racetrack, the Royal Galleries and Maria Hendrikapark in Ostend; the Royal Museum for Central Africa and its surrounding park in Tervuren; the Cinquantenaire park, triumphal arch and complex, and the Duden Park in Brussels, and the 1895-1905 Antwerpen-Centraal railway station. In addition to his public works, he acquired and built numerous private properties for himself inside and outside Belgium. He expanded the grounds of the Royal Castle of Laeken, and built the Royal Greenhouses, the Japanese Tower and the Chinese Pavilion near the palace. In the Ardennes, his domains consisted of 6,700 hectares (17,000 acres) of forests and agricultural lands and the châteaux of Ardenne, Ciergnon, Fenffe, Villers-sur-Lesse and Ferage. He also built important country estates on the French Riviera, including the Villa des Cèdres and its botanical garden, and the Villa Leopolda. On 15 November 1902, Italian anarchist Gennaro Rubino attempted to assassinate Leopold, who was riding in a royal cortege from a ceremony at Saint-Gudule Cathedrale in memory of his recently deceased wife, Marie Henriette. After Leopold's carriage passed, Rubino fired three shots at the procession. The shots missed Leopold but almost killed the king's Grand Marshall, Count Charles John d'Oultremont. Rubino was immediately arrested and subsequently sentenced to life imprisonment. He died in prison in 1918. The king replied after the attack to a senator: "My dear senator, if fate wants me shot, too bad!" (Mon cher Senateur, si la fatalite veut que je sois atteint, tant pis!) After the failed regicide the security of the king was questioned, because the glass of the landaus was 2 cm thick. Elsewhere in Europe, the news of this assassination attempt was received with alarm. Heads of state and the pope sent telegrams to the king congratulating him for surviving the assassination attempt. Many people remembered the earlier assassinations of Empress Elisabeth of Austria and Umberto I of Italy by other Italian anarchists. The Belgians rejoiced that the king was safe. Later in the day, in the Theatre Royal de la Monnaie before Tristan und Isolde was performed, the orchestra played the Brabançonne, which was sung loudly and ended with loud cheers, acclamations, and applause. From the beginning, Leopold ignored these conditions and millions of Congolese inhabitants, including children, were mutilated and killed. :115,118,127 He ran the Congo using the mercenary Force Publique for his personal enrichment. Failure to meet rubber collection quotas was punishable by death. Meanwhile, the Force Publique were required to provide the hand of their victims as proof when they had shot and killed someone, as it was believed that they would otherwise use the munitions (imported from Europe at considerable cost) for hunting. As a consequence, the rubber quotas were in part paid off in chopped-off hands. He used great sums of the money from this exploitation for public and private construction projects in Belgium during this period. He donated the private buildings to the state before his death. Leopold extracted a fortune from the Congo, initially by the collection of ivory, and after a rise in the price of rubber in the 1890s, by forced labour from the natives to harvest and process rubber. Under his regime millions of Congolese people died. Modern estimates range from one million to fifteen million, with a consensus growing around 10 million. :25 Several historians argue against this figure due to the absence of reliable censuses, the enormous mortality of diseases such as smallpox or sleeping sickness and the fact that there were only 175 administrative agents in charge of rubber exploitation. Reports of deaths and abuse led to a major international scandal in the early 20th century, and Leopold was forced by the Belgian government to relinquish control of the colony to the civil administration in 1908. Monument in Arlon (Belgium). "I have undertaken the work in the Congo in the interest of civilization and for the good of Belgium." Leopold fervently believed that overseas colonies were the key to a country's greatness, and he worked tirelessly to acquire colonial territory for Belgium. Leopold eventually began to acquire a colony as a private citizen. The Belgian government lent him money for this venture. In 1894, King Leopold signed a treaty with Great Britain which conceded a strip of land on the Congo Free State's eastern border in exchange for the Lado Enclave, which provided access to the navigable Nile and extended the Free State's sphere of influence northwards into Sudan. After rubber profits soared in 1895, Leopold ordered the organization of an expedition into the Lado Enclave, which had been overrun by Mahdist rebels since the outbreak of the Mahdist War in 1881. The expedition was composed of two columns: the first, under Belgian war hero Baron Dhanis, consisted of a sizable force, numbering around 3,000, and was to strike north through the jungle and attack the rebels at their base at Rejaf. The second, a much smaller force of 800, was led by Louis-Napoléon Chaltin and took the main road towards Rejaf. Both expeditions set out in December 1896. Although Leopold had initially planned for the expedition to carry on much farther than the Lado Enclave, hoping indeed to take Fashoda and then Khartoum, Dhanis' column mutinied in February 1897, resulting in the death of several Belgian officers and the loss of his entire force. Nonetheless, Chaltin continued his advance, and on 17 February 1897, his outnumbered forces defeated the rebels in the Battle of Rejaf, securing the Lado Enclave as a Belgian territory until Leopold's death in 1909. I have just returned from a journey inland to the village of Insongo Mboyo. The abject misery and utter abandon is positively indescribable. I was so moved, Your Excellency, by the people's stories that I took the liberty of promising them that in future you will only kill them for crimes they commit. Estimates of the death toll range from one million to fifteen million, since accurate records were not kept. Historians Louis and Stengers in 1968 stated that population figures at the start of Leopold's control are only "wild guesses", and that attempts by E. D. Morel and others to determine a figure for the loss of population were "but figments of the imagination". A 1906 Punch cartoon depicting Leopold II as a rubber snake entangling a Congolese rubber collector. Inspired by works such as Joseph Conrad’s Heart of Darkness (1902), originally published as a three-part series in Blackwood’s Magazine (1899) and based on Conrad's experience as a steamer captain on the Congo 12 years earlier, international criticism of Leopold’s rule increased and mobilized. Reports of outrageous exploitation and widespread human rights abuses led the British Crown to appoint their consul Roger Casement to investigate conditions there. His extensive travels and interviews in the region resulted in the Casement Report, which detailed the extensive abuses under Leopold's regime. A widespread war of words ensued. In Britain, former shipping clerk E. D. Morel with Casement's support founded the Congo Reform Association, the first mass human rights movement. 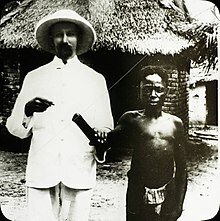 Supporters included American writer Mark Twain, whose stinging political satire entitled King Leopold's Soliloquy portrays the king arguing that bringing Christianity to the country outweighs a little starvation, and uses many of Leopold's own words against him. On 17 December 1909, Leopold II died at Laeken, and the Belgian crown passed to Albert, the son of Leopold's brother, Philippe, Count of Flanders. His funeral cortege was booed by the crowd. Leopold's reign of exactly 44 years remains the longest in Belgian history. He was interred in the royal vault at the Church of Our Lady of Laeken in Brussels. After the king's death and transfer of his private colony to Belgium, there occurred a "Great Forgetting". Many Belgians in the 20th and 21st centuries remember Leopold II as the "Builder King" for his extensive public works projects. In the 1990s, the colonial Royal Museum for Central Africa made no mention of the atrocities committed in the Congo Free State, despite the museum's large collection of colonial objects. On the boardwalk of Blankenberge, a popular coastal resort, a monument shows a pair of colonists as heroes protecting a desperate Congolese woman and child with "civilization". In Ostend, the beach promenade has a 1931 sculptural monument to Leopold II, showing Leopold and grateful Ostend fishermen and Congolese. The inscription accompanying the Congolese group notes: "De dank der Congolezen aan Leopold II om hen te hebben bevrijd van de slavernij onder de Arabieren" ("The gratitude of the Congolese to Leopold II for having liberated them from slavery under the Arabs"). In 2004, an activist group cut off the hand of the leftmost Congolese bronze figure, in protest against the atrocities committed in the Congo. The city council decided to keep the statue in its new form, without the hand. The debate over Leopold's legacy was reopened in 1999 with the publication of King Leopold's Ghost by American historian Adam Hochschild. In the book Leopold was portrayed as a mass murderer and compared to Hitler. The book was controversial in Belgium but widely praised by American scholars and critics. Leopold II remains a controversial figure in the Democratic Republic of Congo. His statue in the capital Kinshasa (known until 1966 as Leopoldville in his honor) was removed after independence. Congolese culture minister Christophe Muzungu decided to reinstate the statue in 2005. He noted that the beginning of the Free State had been a time of some economic and social progress. He argued that people should recognize some positive aspects of the king as well as the negative; but hours after the six-metre (20 ft) statue was installed near Kinshasa's central station, it was officially removed. Leopold's sister became the Empress Carlota of Mexico. His first cousins included both Queen Victoria of the United Kingdom and her husband Prince Albert, as well as King Fernando II of Portugal. Princess Louise of Belgium, born in Brussels on 18 February 1858, and died at Wiesbaden on 1 March 1924. She married Prince Philipp of Saxe-Coburg and Gotha on 4 February 1875, they divorced on 15 January 1906 and had two children. Prince Leopold, Duke of Brabant, Count of Hainaut (as eldest son of the heir apparent), later Duke of Brabant (as heir apparent), born at Laeken on 12 June 1859, and died at Laeken on 22 January 1869, from pneumonia, after falling into a pond. Princess Stéphanie of Belgium, born at Laeken on 21 May 1864, and died at the Archabbey of Pannonhalma in Győr-Moson-Sopron, Hungary, on 23 August 1945. She married (1) Crown Prince Rudolf of Austria, the heir apparent to the throne of Austria-Hungary . In 1889, he died in a suicide pact with his mistress, Baroness Mary Vetsera, at the Mayerling hunting lodge. Stéphanie's second husband was (2) Elemér Edmund Graf Lónyay de Nagy-Lónya et Vásáros-Namény (created, in 1917, Prince Lónyay de Nagy-Lónya et Vásáros-Namény). Princess Clémentine of Belgium, born at Laeken on 30 July 1872, and died at Nice on 8 March 1955. She married Prince Napoléon Victor Jérôme Frédéric Bonaparte (1862–1926), head of the Bonaparte family. The current head of the Imperial family, Jean-Christophe, Prince Napoléon is a direct descendant of King Leopold II. 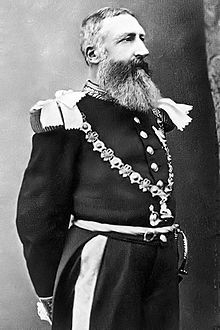 Leopold II founded the Order with his own name in 1900. 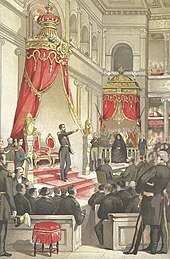 9 April 1853: Leopold was given the Grand Cordon of the Royal Order of Leopold by his father, as a gift for his 18th birthday. The last photo taken of Leopold II before his death. A father stares at the hand and foot of his five-year-old daughter, severed as a punishment for having harvested too little rubber. Coronation Medal Leopold II - accession to the throne on 17 December 1865 - by Léopold Wiener. ^ "Snuffbox with a miniature portrait of King Léopold II | Heritage KBF". www.heritage-kbf.be. Retrieved 2019-02-28. ^ Sophie Mignon. "Non, Léopold II n'est pas un génocidaire!" (in French). ^ a b c d One or more of the preceding sentences incorporates text from a publication now in the public domain: Chisholm, Hugh, ed. (1911). "Leopold II., King of the Belgians" . Encyclopædia Britannica. 16 (11th ed.). Cambridge University Press. p. 461. ^ a b "Leopold II". The Belgian Monarchy. Retrieved December 4, 2013. ^ (in French) « la patrie doit être forte, prospère, par conséquent posséder des débouchés à elle, belle et calme. » The King to the Count of Flanders, January 26, 1888; The Count of Flanders's papers. ^ Stengers, Jean (2008). L'action du Roi en Belgique depuis 1831: pouvoir et influence [The action of the King in Belgium since 1831: power and influence] (in French) (3rd ed.). Brussels: Racine. pp. 123–4. ISBN 978-2-87386-567-2. ^ a b c Ewans, Sir Martin (2017). European Atrocity, African Catastrophe: Leopold II, the Congo Free State and its Aftermath. Routledge. doi:10.4324/9781315829173. ISBN 9781317849070. ^ Jalata, Asafa (March 2013). "Colonial Terrorism, Global Capitalism and African Underdevelopment: 500 Years of Crimes Against African Peoples". Journal of Pan African Studies. 5 (9). ISSN 0888-6601. ^ Stanley, Tim (October 2012). "Belgium's Heart of Darkness". History Today. 62 (10): 49. ISSN 0018-2753. ^ a b Ocampo, Ambeth (2009). Looking Back. Anvil Publishing. pp. 54–57. ISBN 978-971-27-2336-0. ^ a b c d e f g h i Hochschild, Adam (1998). King Leopold's Ghost: A Story of Greed, Terror and Heroism in Colonial Africa. Mariner. ISBN 978-0-330-49233-1. OCLC 50527720. ^ Charles de Kavanagh Boulger, Demetrius (1898). The Congo State: Or, The Growth of Civilisation in Central Africa. Congo: W. Thacker & Company. ISBN 0-217-57889-6. p. 214. ^ Pakenham, Thomas (1992). The Scramble for Africa. Avon Books. ISBN 978-0-380-71999-0. p. 525-6. ^ a b Dummett, Mark (24 February 2004). "King Leopold's legacy of DR Congo violence". BBC. Retrieved 1 December 2011. ^ Forbath, Peter (1977). The River Congo: The Discovery, Exploration and Exploitation of the World's Most Dramatic Rivers. Harper & Row. p. 278. ISBN 978-0-06-122490-4. ^ Louis, William Roger; Stengers, Jean (1968). E. D. Morel's History of the Congo Reform Movement. London: Clarendon. pp. 252–7. OCLC 685226763. ^ Guy Vanthemsche (2012). Belgium and the Congo, 1885-1980. Cambridge University Press. ISBN 9780521194211. ^ "The 'Leopold II' concession system exported to French Congo with as example the Mpoko Company" (PDF). Archived from the original (PDF) on March 27, 2009. Retrieved 2011-12-02. ^ "Le rapport Casement annoté par A. Schorochoff" (PDF). Posted at the website for the Royal Union for Overseas Colonies, http://www.urome.be. ^ Dargis, Manohla (21 October 2005). "The Horrors of Belgium's Congo". www.nytimes.com. Retrieved 4 December 2016. ^ "Leopold II krijgt zijn hand terug als Oostende zwicht" [Oostende herstelt afgehakte hand van Leopold II niet] (in Dutch). 2004-06-22. Archived from the original on 2014-01-01. Retrieved 2012-08-13. ^ "The hidden holocaust". the Guardian. 1999-05-13. Retrieved 2018-10-20. ^ Godwin Rapando Murunga (1999). "King Leopold's Ghost (review)". African Studies Quarterly. 3 (2). Archived from the original on 18 June 2012. Retrieved 13 June 2012. King Leopold's Ghost tells the story of the Congo with fresh and critical insights, bringing new analysis to this topic. ^ Vasagar, Jeevan (4 February 2005). "Leopold reigns for a day in Kinshasa". The Guardian. ^ a b c "Le Petit Gotha"
^ "George Washington Williams's Open Letter to King Leopold on the Congo". blackpast.org. 1890. Retrieved 12 January 2017. ^ a b Almanach royal officiel: 1877. 1877. p. 13. ^ "Toison Autrichienne (Austrian Fleece) - 19th century" (in French), Chevaliers de la Toison D'or. Retrieved 2018-08-07. ^ Jørgen Pedersen (2009). Riddere af Elefantordenen, 1559–2009 (in Danish). Syddansk Universitetsforlag. p. 273. ISBN 978-87-7674-434-2. Wikimedia Commons has media related to Leopold II of Belgium. Grant, Kevin (2001). "Christian critics of empire: Missionaries, lantern lectures, and the Congo reform campaign in Britain". The Journal of Imperial and Commonwealth History. 29 (2): 27–58. doi:10.1080/03086530108583118. Peffer, John (2008). "Snap of the Whip/Crossroads of Shame: Flogging, Photography, and the Representation of Atrocity in the Congo Reform Campaign". Visual Anthropology Review. 24: 55–77. doi:10.1111/j.1548-7458.2008.00005.x. Weisbord, Robert G. (2003). "The King, the Cardinal and the Pope: Leopold II's genocide in the Congo and the Vatican". Journal of Genocide Research. 5: 35–45. doi:10.1080/14623520305651. Langbein, John H. (January 1976). "The Historical Origins of the Sanction of Imprisonment for Serious Crime". The Journal of Legal Studies. 5 (1): 35–60. doi:10.1086/467543. JSTOR 724073. Gewald, Jan-Bart (2006). "More than Red Rubber and Figures Alone: A Critical Appraisal of the Memory of the Congo Exhibition at the Royal Museum for Central Africa, Tervuren, Belgium". The International Journal of African Historical Studies. 39 (3): 471–86. JSTOR 40034827. Pavlakis, Dean (2010). "The Development of British Overseas Humanitarianism and the Congo Reform Campaign". Journal of Colonialism and Colonial History. 11 (1). doi:10.1353/cch.0.0102. This page was last edited on 14 April 2019, at 12:44 (UTC).